On this fine Spring evening we gathered to discuss Betty’s book choice, Call the Midwife by Jennifer Lee Worth. Present at the meeting were Beth, Betty, Colette, Jolene, Linda, Louise, Michèle and Shirley. Our host Shirley had some wonderful British cheese, pigs in a blanket and a very nice pâté with gluten free crackers. She had also prepared individual English trifles, all very nice. Jennifer Lee Worth was born in Essex and left school at 15. She trained as a nurse and later as a midwife in a convent. When she retired, she tried several ventures including singing. She was encouraged late in life to write a memoir of her time as a midwife in the East End of London. 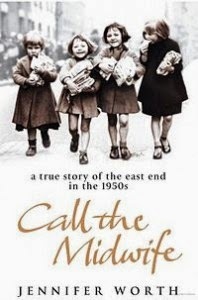 Call the Midwife was published in 2002 and was later developed into a series. Ms. Worth did not however live to see the series; she died in 2011. All who read the memoir enjoyed the book very much. It provided a historical background, how midwifery began and came from, and how it evolved. It provided a good description of the conditions in which women in East London lived. It gave graphic details about births, problems that could occur. It was noted that midwifery has been accepted in Europe for many years and is only beginning to be accepted in North America. Ms. Worth, in a well-written memoir, provided a lot of information about the lives of the Protestant nuns and even though she did not share their faith, came to respect their lifestyle and the dedication they had to midwifery and the women of the East End of London. Many of the women who came to train as midwives were well-educated, middle class women who knew nothing of the difficult lives of East End women but learned to respect them. We had a discussion about the television series that was based on Ms. Worth's trilogy. Many enjoyed the televised series more because it focused on the persons. It was more a story about the people involved, Miss Jennie, Sisters Julienne, Evangelina and Bernadette and two other midwives, Trixie and Cynthia. There are several other characters. It is more of a drama than the book that is a recollection of Ms. Worth's career as a midwife. This was an excellent choice that gave us a chance to learn more about post-war London and the profession of midwifery. Thank you Betty for an excellent book choice. I really enjoyed this book. It was an amazing memoir of an age that is long passed. The large families, cramped quarters and sense of community were all well described. I also found the connection with what became of some of the children to be quite interesting. I read some of the third book in the series, and it gives an accurate update on the midwives, with details that vary from the television series. Once Chummy and her husband relocated to Sierra Leone, for example, they stayed in Africa throughout their lives. Cynthia remained a best friend to Jennifer, even becoming the godmother to her daughter Suzannah. As you all know, I adored this book, and the series. I came away thinking that there were two points we didn't get around to discussing that are very thought-provoking: Can you imagine that everything we saw people coping with in the book, they coped with in addition to the hardships and terror of the Blitz during WW2? and, While we are probably thankful to live in a time of better health care and housing conditions(at least our group! ), were there things about their lives and maternal care that were positive, even better than now?